Richard Armitage – is it love because we can relate? When the news broke about Richard Armitage landing a major role in The Hobbit, I couldn’t help but being filled with mixed emotions. One part of me was absolutely thrilled that he’s been given such a chance, and another part of me wants to start writing sympathy cards or “I’m sorry for your loss … of privacy”. Don’t get me wrong, I think The Hobbit is a great opportunity for advancing his career. Being disguised by the beard, he’s not going to get admirers from an “OMG he’s GOWGEOUS!” point of view (although those of us who are familiar with him will of course go “OMG that’s one smoulderingly hot dwarf!” – especially now that we know what the man looks like in a beard) but rather, he’ll be judged on his acting merits. Which is great! Those eyes can express what a thousand words struggle to, and there’s still The Voice. He’ll get to act and get people noticing him for his acting skills, and get new fans because of that. (Won’t some of them be surprised when they realise that he’s 6’2″ and devastatingly handsome?) It’s likely to get him more, and bigger, roles as well, so that’s great! The world can see what a great actor he is and maybe FanstRAvaganza 4 or 5 will be an even bigger event with lots of new fanbloggers. However, like the title says, I feel an odd sense of pride and trepidation. I’m really proud that he’s got a big role in a movie that people all over the world are wanting to see, and are GOING to see. “Our” Richard is going to be a “proper” star, and get all the recognition for his acting that he deserves and has worked so hard for. The trepidation part is what might (and is likely) to come with it. That he won’t be “our” Richard so much … well, actually, that bit doesn’t bother me that much – I see it as we gain more friends, as a lot more people will discover him and fall hopelessly into fandom like the rest of us. Thorin smoulders all by himself! It’s more that he’s a private person and that increasing fame is going to lead to more publicity, which he might not be too keen on, and also, I’m worried because increased fandom will mean he’ll have more nutters after him as well. Not all of us are well-behaved and stick to blogging about Thornton’s cravats and dream about what it would be like to meet him and make tribute cartoons and review the latest Spooks episodes and such. There is also the underwear-sending fraction of us (although I hesitate to use the word “us” as I don’t really wish to associate with would-be stalkers), and I can see that getting worse. So for his sake, I’m a bit cautious. He’s old enough to look after himself, certainly, but … he’s going to have to get a lot thicker-skinned, because being a fairly successful Leicestershire lad on the BBC is miles away from being a fairly successful Leicestershire lad in Hollywood. If you know what I mean? How do you feel about “Our” Richard being unleashed unto the world thanks to Hollywood? One of the big attractions for me is that he’s a nice and polite guy who doesn’t need to constantly brandish his ego and brag and all that. We don’t see him every time we open Heat magazine or whatever celebrity gossip rag people read, and he doesn’t flaunt himself at any given moment. He’s happy to stay in the shadows a bit. Perhaps he feels uncomfortable being the centre of attention? I know I do, and I bet plenty of you do too. Maybe that’s one of the reason why we like him so much, because we can relate. The fact that he’s discreet, seems like an honest and hard-working (maybe even a little too hard working) guy and he just wants to get on with his life, be a regular bloke … with a successful acting career. What do you think? Is Richard’s attitude of keeping his private life separate from his professional life something you respect and admire, or does it get on your nerves? 17 Responses to "Richard Armitage – is it love because we can relate?" Personally, I could not be happier for the guy. It’s probably every actor’s dream to be in the biggest movie EVER in the WORLD. 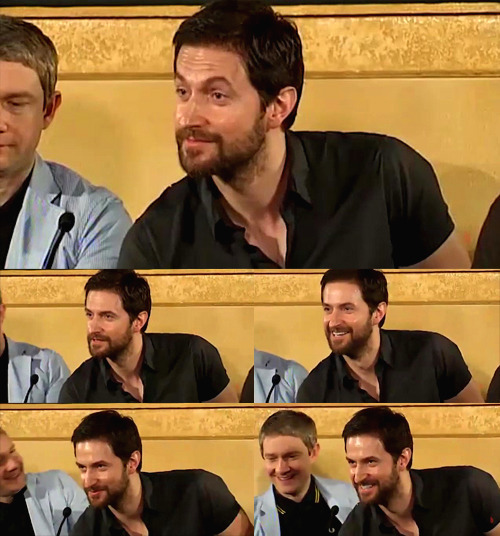 Wow, I’m so thrilled that Peter Jackson saw Richard Armitage’s talent and took a chance on a relative unknown. I can’t speak to how this will change anyone’s life. It really may not have much of an effect, but I’m an optimist. Best of luck to a talented actor! I’m sorry hun but “The Voice” is Alan Rickmans. Armitage can be a close second. I think he’s very smart and will manage to keep his personal life private, especially if he stays away from Hollywood. Working there is one thing, but living there is another. That town is a prison for celebrities, especially those who are as private and shy as Richard. I wish him the best of luck and look forward to his future projects. I’ve been following The Hobbit films’ progress for quite a while. A few of us wanted him cast as Bard and frankly, that role would have sent the fans thudding. I’ll be interested to see what he and the writers make of Thorin as to me he isn’t a heart throb and RA will be disguised under all the hair and beards imo. In terms of increasing his profile, I guess he will become more well known once the films are released (in two years?). For the time being however (and going by what the tweeter in NZ said at the FilltheBowl cricket match last weekend), RA is quite possibly enjoying some blissful anonymity in Wellington as no one knows who he is. I actually think he has less privacy and is more likely to be bothered by over zealous fans when he is working in the UK. I’m not keen on the Hollywood scene either, and I hope RA is able to follow a career path similar to that of Colin Firth or even Ian McKellen. Watching Vicar of Dibley again, I realise that some of the “innocence” of the early period of his acting career has already been lost with RH 2 & 3, Spooks & SB. As always, I think he should do precisely what make him happy. I agree he’s going to have to develop a thicker skin — sadly for us, since one imagines that means less transparency. I’m not sure how I feel about “our” Richard. Perhaps that’s because I’ve never thought of him as “our” Richard. I’ve made jokes about that, but that is in fact what they are — jokes about the familiarity we sometimes display in the “fandom” (despise that word). But then what’s coming may give lie to all of that. I really don’t know how I’ll react. For the most part I’m not used to an actor being so connected with his fans. Then again, I’ve never been a “fan” in this sense, so how would I know? As for the privacy issue, I’d be lying if I said I wasn’t sometimes curious about his private life, but I don’t get people prying. I don’t get people sending underwear. I don’t get people wanting to know where he lives in London. At least I don’t get normal people doing that. I’ve had people send me notes asking about his address. Huh? If I knew it, which I do not, I would never supply it to someone. The mere act of requesting it makes them suspect. Tribute cartoons? What kind of a nutty fan would do something like that!? Poor guy. I’m PROUD of RA too, Trax. Sarah: I agree and hope he’ll keep living back home in Britain rather than settling over in LA. Now I relly don’t know.Do I love Richard or all of wonderfull Ladies from Rafandom. Hi Traxy, I agree with everything you say about our Gorgeous! You have great sense of humour and show a very respectful attitude, so each post of yours amuse and melt me very much! I completely agree with you regarding RA and Holliwood. I am European and think that so often British actors have been used by the US star system not at best of their possibilities. But fortunately they all come back to UK productions’ quality, and offer their best performances. Thank you for your blog. I love it very much! Peter Jackson seems to love turning very tall actors into dwarves. John Rhys-Davies who played Gimli is around 6 feet himself. Being a Yank, I discovered RA late by catching Robin Hood episodes online. When I first heard he was going to be in The Hobbit as one of the dwarves, I thought, well how is _that_ going to work? But then I saw his costume and all I have to say is, “OMG, it _IS_ Thorin Oakensheild!” That’s pretty much how I imagined the character when reading The Hobbit. ItsFun2Squee: Wait, you’ve seen his costume?! Where??! Apparently, JRD being a six-footer made it easier to resize him with perspectives with regards to the hobbits. I was thinking the same thing, he is so lovely and hollywood will spoil him. But he is older and probably know what life is all about by now. I just wish for him a loving wife and lots of kids and happiness. He has said that if you don’t go to LA people will think you have failed, what people? I am sure none of us think that. As long as he has someone at home to give him a cuddle and a laugh I think he will be fine.